4X-GMPR HRCH Black Forest Bear Grits MH (Bear Boy) was a dog that had heart. Bear was not afraid to take on any challenge. He became a 4X-GMPR in the APLA, He received his Hunting Retriever Champion title and earned 250 points in HRC, He is an AKC Master Hunter. But besides the testing he proved that a pointing Labrador could compete in an open pointing division running against all pointing breeds. 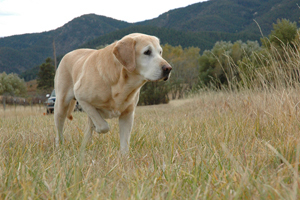 He won 4 National Championships in North American Gun Dog Nationals running against all pointing breeds. He won the Wyoming Open Pointing Pheasants Championship, Colorado Quail Classic Open Pointing Championship and had many top 5 finishes over the years. He was respected in the pointing dog world. Bear also has passed on those great traits, in his genetics. He has Sired 43 litters. To date in the APLA there are eleven GMPR or above at which Five of them are 4X-GMPR. Very few 4X-GMPR have produced other 4X-GMPR, he is one of the leaders in that field. There are also many sons and daughters that have CPR and APR titles in the APLA. He has hunted wild birds in 9 different States, anything from Dove, Grouse, Quail, Chukar, Pheasants, Huns, Ducks and Geese. But above all that, he was a companion, the most loyal friend and forgiving animal one could ever have, it was a honor being part of his life. May his legacy live on in everyone's hearts. He has taught me as much as I taught him. The trust and bond will live on forever in Dale and Brenda's HEARTS. God Bless!